A blog from Monique, Josh and Isaac Newberry - a family of volunteers! 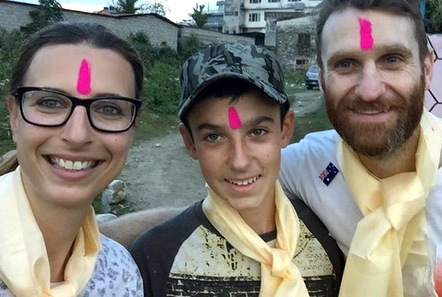 This year Monique, Josh and Issac didn't go on a standard family beach holiday, instead they decided to spend their annual leave volunteering with the children in Nepal for 2 weeks. Here is their blog about their experiences in Nepal with Pod Volunteer. 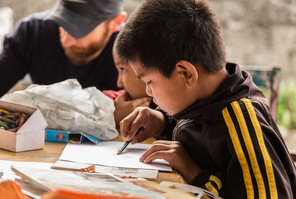 "Nepal touched our hearts and impacted our lives more than we ever expected. 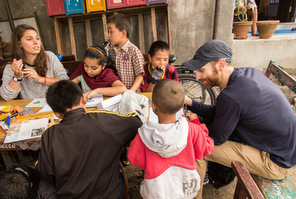 The choice to volunteer as family in Pokhara, Nepal was about stepping out of our usual routine and comfort zone. To gain an appreciation of a completely different culture and experience how others live, without all the luxuries that we have become accustomed to in the western world. We chose the placement in Pokhara, Nepal after researching the area and then talking to Pod staff who explained that it was a beautiful and safe environment for our family to spend a few weeks volunteering. We wanted a challenge, but when travelling as a family we also needed to ensure safety was a priority, while still being able to immerse ourselves in the daily Nepali lifestyle. As a bonus - Pokhara and the surrounding areas truly was one of the most beautiful places we have ever visited. We went in with no expectations in order to keep an open mind. We are happy to say from the moment we arrived and met Janice (Pod staff) and then settled into Bindu’s guesthouse, we felt immediately at home and were made to feel so welcome. The other volunteers we met, as well as other groups staying at Bindu’s, was a real bonus as we loved sharing stories with people from other countries that we crossed paths with on our travels. The food at Bindu’s was a real highlight and the rooms were spacious and comfortable with everything we needed. We did not expect much and knew that electricity is often unavailable, but were pleased to have private and comfortable accommodation and felt right at home with Bindu and her family. Pod Volunteer staff, Sarah and Janice, were brilliant and we felt supported for our whole stay and with any questions we had, whether it was about the placement or where to eat out or what hikes and activities they recommended we explore on the weekends. It was also a real highlight to go out all together for a welcome dinner on our first night as well as going to the pub Silk Road together for Janice’s bands gig – they were fantastic!! Our volunteering placement consisted of 3 hours in the morning at a child care centre Ward 6 (for low income families allowing the parents to work). We fell in love with the children (around 2 to 3 years old). We had a lot of fun singing nursery rhymes, playing ball games and teaching the kids some English including numbers, letters, colours, animals etc. They were such a joy to be with and we went away with an appreciation for all the work the teachers have to do as there are often only 1 or 2 to around 20 kids when there are no volunteers. Our afternoon placement was spending a couple of hours at Street Kids, a boy’s orphanage, where we also fell in love with all the boys. Our son particularly loved this placement as the boys were around his age and they all immediately hit it off! It was so brilliant to see how culture and language are no barrier to forming bonds. Playing cricket or football outside was all it took and we just loved seeing all their faces light up when they saw us walk up the street to their house each day. They are such intelligent and loving boys - saying goodbye really was so sad (something we didn’t think of or expect before our trip) but we will be sure to keep in touch with them. We will never forget this experience and everything we learned - that you don’t need much to live a life filled with love, that simple gestures form immediate bonds despite any cultural barriers, that there is nothing more heart-warming than sitting around a table sharing stories and laughter with people from different backgrounds over a traditional home cooked meal, and that the Nepalese truly are some of the most hospitable, welcoming, honest and genuine people we have ever come across in all our travels. We will always remember what we learned in our Nepali language lesson in the first week – that NEPAL really is the land of Never Ending Peace And Love!!! Thank you for all you brought to our lives, it was a priceless experience that we recommend to any family (or any individual) wanting to have an unforgettable experience." You can read about family volunteering opportunities with Pod Volunteer here. If you would like to find out about joining Pod Volunteer in Nepal then see our volunteer project pages for more details. If you would like to apply to volunteer in Nepal please complete our online application here.